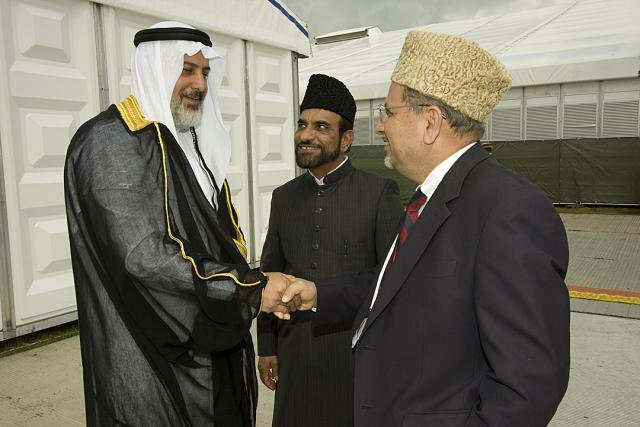 The Qadiani Ahmadiyya spent the last decade flirting with Islamophobes, supporting middle eastern wars, and vilifying Pakistan, Indonesia and other Muslim countries. Recently, Mirza Masroor Ahmad, the head of the Qadiani Ahmadiyya offshoot of Islam, appears to be attempting to gain some relevance as history passes him by. We decided to delve into this trend in some detail as his ham-handed attempts are creating security concerns for Muslims in Europe, U.K., Canada and the United States. Paradoxically, the sympathy that the movement had managed to garner out of their ill-treatment and discrimination in Pakistan and elsewhere seems to be fast evaporating. While these recent idiosyncratic statements appear to have been primarily targeted at the internal captive audience, eyebrows are being raised as the repercussions are affecting the Muslim community. Known more as a manager than a leader, Masroor has rarely taken a position on significant issues and has been content to work behind the scenes. When he has taken a position, it has invariably been a random page out of the U.S.-neocon anti-Islamic book. The events about which these statements have been made may have been local but their impact is global. Thus, it needs a broader analysis. Such positions are in line with the history of this politico-religious organisation. For over 120 years, the group has been shopping itself around to any takers as an ‘alternate to Islam’. In the 19th century, there were the fervent but unrequited paeans of loyalty from its founder to Queen Victoria and his whispered complaints about ‘fanatical’ Muslims to the Viceroy. In the 20th century, it was an intense political desire to take over a Pakistani province or to ‘somehow’ reverse the partition of India. In the 1980s, London was chosen as their international headquarters, despite having functioning and bustling ‘headquarters’ – one each in India and Pakistan. There is also a Middle Eastern headquarters in Haifa, Israel. In the first decade of the 21st century, observers can see the group join forces with think tanks such as the Hudson Institute in the United States and the ICSR in the U.K., with the presumptive goal of influencing the legislative processes in Islamic countries. The late-life conservative, Christopher Hitchens, was a friend of the Hudson Institute while his son, Alexander Meleagrou-Hitchens, is a fellow at ICSR. The internal messaging has been ‘Muslims are leaderless, dispersed and finished, you are the real Muslims’ and the public theme has always been: ‘Islam is dead, we are at your disposal’. All these verbal and political acrobatics are to just to justify these increasingly unjustifiable positions. So, why this sudden turn of events that Masroor is forced to take a more belligerent position? Perhaps the winds have shifted. Let us take a deeper look and see why. With less than a thousand Arab adherents, the organisation funds a 24-hour Arabic satellite channel known as MTA-3. It ran round-the-clock Arabic programmes, including call-in shows, opposing the Arab Spring and calling it an act of treason and against ‘Islamic’ theology. As usual, the ostensible goal would be better relations with surviving dictators, as most real Islamist organisations were behind the popular uprisings. The protagonist of this exercise against the Arab spring was a Palestinian named Sharif Odeh who had put together a coterie of Palestinian religious drifters. They had trouble managing the flowing but mis-matched Arab robes on TV that are so alien in the parts from where they hail. Just keep this in mind for now: these protagonists are the cause of the PR debacles as they hurtle, vision-less, from one botched scheme to another. This was around the time when our robed Mr. Odeh was embarrassed by a series of email leaks. At one point he had resorted to pursuing a leading Palestinian mufti towards the end of a one-year prayer duel, for which Masroor himself had asked all his followers for prayer ‘ammunition’. The happy-go-lucky Muslim cleric lives and frustrated Mr. Odeh’s plans for achieving a coup. Similarly, Rafiq Hayat of the U.K. has been spending busloads of money on bus ad campaigns that try to sow the seeds of hatred against the Muslim community in the U.K. For almost two years, he has been scaring parliament and the police that ‘suicide attacks’ are going to happen in Britain and that violence against the Ahmadiyya is imminent. For a while, they were convinced, but the tide has turned. In the picture on the left, he was wading into the Florida pastor’s controversy — urging people to ignore such events — and that will lead us to the story below about Quran exhibitions. This is why I write this today — the tone of the past two years has changed, and the change is coming from none other than Masroor Ahmad himself. In the United States, a much more sinister campaign is under way to beguile the American government to adopt the Ahmadiyya as the ‘American-choice Islam’ and all types of alliances are being attempted. We have it on the record that the State department reads out the Ahmadiyya briefing word-for-word during its human rights report on Pakistan. Similarly, the U.S. government has accepted 94 Ahmadi refugees without legal process into America. It will take a while, but Americans will smarten up. 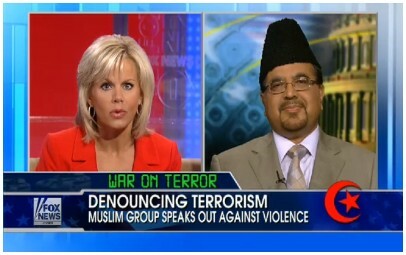 Their media campaign was horrifying: the slick Nasim Mahdi had been sent from Canada to parrot the following unbelievably Islamophobic phrase ‘why are Muslims not condemning terrorism?’ This campaign backfired with a bad showing on Fox — who only wanted the bad stuff about Muslims and Mahdi was not willing to oblige them all the way — and a watershed debate on Aljazeera in which Muslims were represented by the founder of this site. The blanet accusations on Muslims are mind-boggling and paradoxically — childish and immature. Those in the know are aware of the anti-terrorism work of Muslim groups – therefore such propaganda is targeted at lay people and is shockingly Islamophobic. With a person appearing to be a Muslim, it comes across even stronger. We hope we have seen the back of this nasty campaign. below 10,000 which would be considered a critical mass from which to draw the finances and volunteer manpower required for the headquarters. Ahmadiyya is too small to register much interest in the mainstream media, and large enough to cause serious problems for others. The Internet has given a platform at the right level to media and other organisations to track, analyse and report on this group. The Florida pastor incident led to this Quran exhibition project. 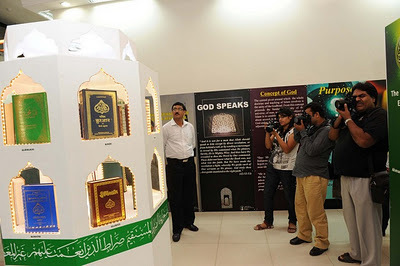 One exhibition created a law and order situation in Delhi, and in another Indian city, Qadiani Ahmadis had to apologise to the local Muslims after calling them terrorists. 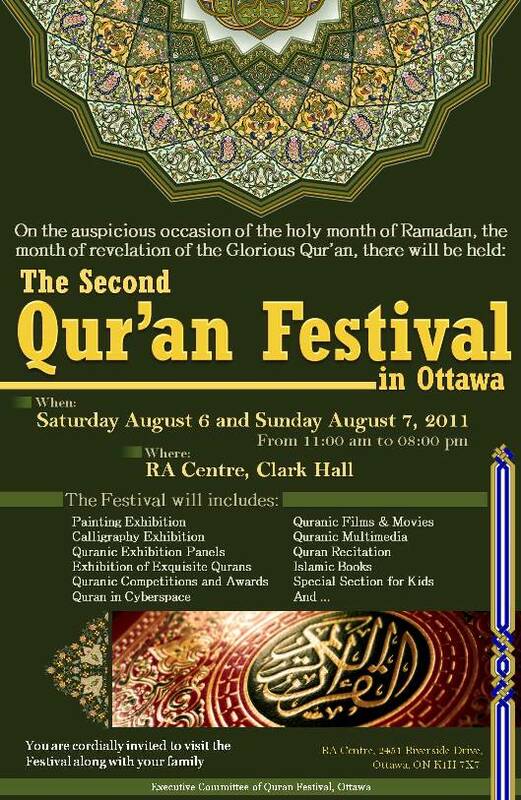 The purpose of these Quran exhibitions seems to be to create local disturbance as they inevitably contain ‘Muslims are terrorists’ theme. “It should be made very clear to the organisers and this exhibition should be held again. Some people say ‘let us arrange it quietly’. What is the use of doing it quietly? On one hand, we claim that we are going to move the mission of the ‘Champion of Allah’ forward, and on the other hand, show hesitation in the field. As I said, there is the rule of law in this country. The government claims that there is rule of law here. Then say to the law – it is your job to implement it. And giving the right of each citisen and protecting him. And you should do it. What then is the difference between those extremists who protest on the return of British soldiers’ bodies and the Ahmadiyya? The local community does not want both there but they insist that it is a free country and the police should protect them. At least the political and media-attention motives of the extremists are not disguised as ‘exhibitions’. 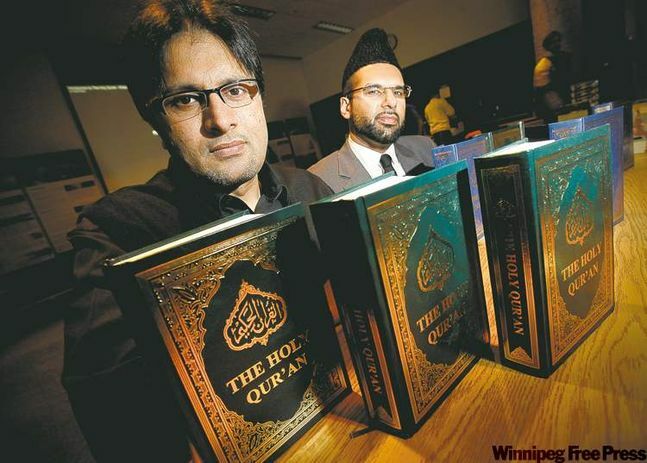 In this information age, when every format of Quran, and every translation, is available online and on smartphones and everywhere else, a bland town-hall presentation may do some good, but doe not break any ground. On the other hand, it may cause community issues with either nationalist groups or majority Muslim communities who feel voiceless. An exhibition is of something rare and unique — such as manuscripts or specialty scripts. Even if it weremarginally beneficial, you can see from these pictures below that they are mostly Pakistani get-togethers and media photo opportunities — and little more. 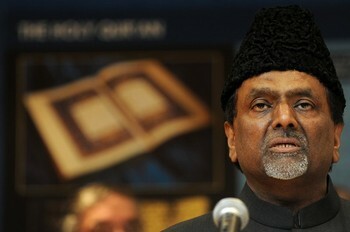 Mr. Masroor, your TV channel does not even broadcast complete round of sermons on the Quran in Ramadan. How can you stand up and say that Muslims, who have Quran schools by the dozen in the U.K., are not doing the work of the Quran and you are? The real matter is that those Muslims have to live in the community and work with one another and with local law enforcement while your group is just an opportunist troublemaker that will drive in, create tensions, and then drive off. It is understandable that Masroor is in quite a bind these days. In our humble opinion, the way out for him is to stop vilifying Muslims and encourage his followers to build bridges with the wider Muslim community. Yes, Muslims will never come to love you, but a means of open understanding and honest dialogue can be developed. Ahmadiyya literature is replete with the notion that Ahmadis are to Muslims what Christians were to Jews. Since the Ahmadiyya faith is so used to drawing parallels, why not work on the same parallel and establish some level of communication based on a common heritage — as Ahmadiyya is also an offshoot of Islam. The Mormons also reached the same conclusion with Christianity a while ago. When you get a brand-new rophet who comes with a great number of books, it is time to move on, mend fences and display your Messiah’s books. Good for you. And we will be happy for you. Why — oh why — have we never seen an exhibition of the great works of the Messiah himself? I will let the reader guess. 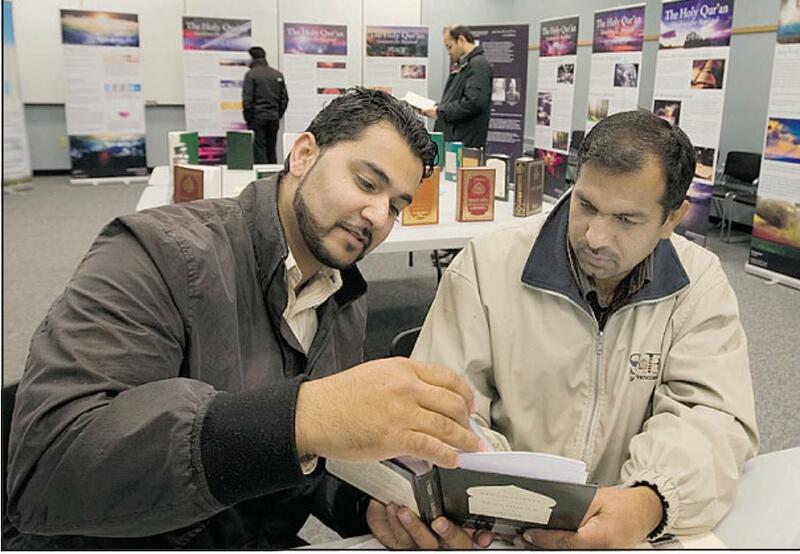 If you do arrange an exhibit of the books of Mirza Ghulam Ahmad, your prophet and great-grand-father, I can assure you that Muslims will not only stay out of the way, they will help you to organise it. Remember Mr. Odeh, the Palestinian who dresses up in Gulf Arab robes. Well you can see him here wearing his robes when talking to members of his community, and then wearing Pakistani (Ahmadiyya ritual dress) when meeting the pope. He was among the representatives of each religion in the Holy Land who were invited by the pope. The Israeli religious ministry knows well (having given birth to Christianity) that Qadianis are a separate religion – and that is why they had their own representative in the delegation. Similarly, laws about Arab Muslims do not apply to Arab Qadianis in Israel. appease his master for not delivering on previous projects. Talking about this event, Mirza Masroor stated on 9th December that other Muslims only met such leaders to ask for money and no Muslim had ever given a message to the Pope. Now, this is a lie, and Mr. Odeh should know it. 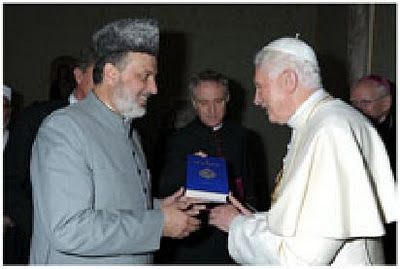 There have been delegations and good relations between the Roman Catholic Church and Islam throughout history. Very recently,’A Common Word‘ is the historic message from prominent Muslim religious leaders to the Pope and other Christian prelates — a message that was received and answered. It was based on the Muslim identity and unity that came about as a result of the Amman Message. Either Mr. Odeh did not tell his master, Mirza Masroor, who can be presumed to be ignorant of this historic development — a development that resulted in a change of policy in Europe and in the United States — or Mr. Masroor believes that his flock is so ignorant that they will fall fo this. 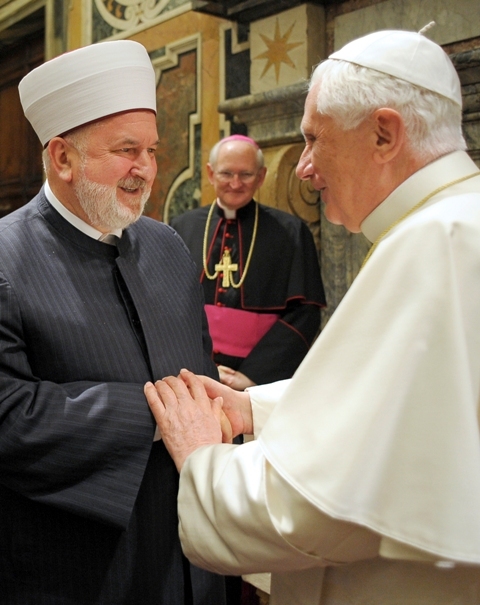 Here is Grand Mufti Imam Ceric with the Pope as part of the ‘A Common Word’ dialogue. In 2009, when Wilders produced his contemptible film, Masroor was silent while his subordinates were busy vilifying Muslims for their reaction to Wilders, thankfully of which there was little. After two years, and after feeling safe that the U.K. had banned Wilders and the ban was only overturned on appeal, Masroor Ahmad wades into the mess. In Holland, Wilders’ home country, he threatens ‘humiliation, annihiliation and destruction’ upon Wilders. Wait a second — he added that this destruction and annihilation will be through prayers! And then he went on to praise Queen Beatrix, who did not reciprocate. Rewind to 1898 when the British made Mirza Ghulam Ahmad, great-grandfather of Masroor, sign an affidavit to stop his ‘prayer destruction and killing’ advertisements. They tolerated him for 15 years and then put a stop to it. The Qadiani prophet, messiah, mahdi, avatar, guru (am not making these up) complied and dutifully obeyed the law for the rest of his living days. I would strongly advise Masroor from trying this out in this day and age — the result will be the same. Wilders picked up on this provocation and went and asked questions of the Dutch parliament. Parliament sheepishly replied ‘yes, there is nothing violent in it, only prayers.’ The European Islamophobic site ‘Gates of Vienna’ opined best: So which Islamic heresy will denounce Geert Wilders next? The Baha’is? Such sabre-rattling, even with prayers, is still dangerous. How will Mr. Masroor feel if these words were used for him and his group? Every time the Ahmadiyya have an internal problem, they bring up the Third World War. I have been hearing it for last 40 years at least. It doesn’t matter what the geo-political situation is, a Third World War is enough to keep poor cult-like Ahmadis cowering in fear and seeking refuge with their fearless and dear leader. 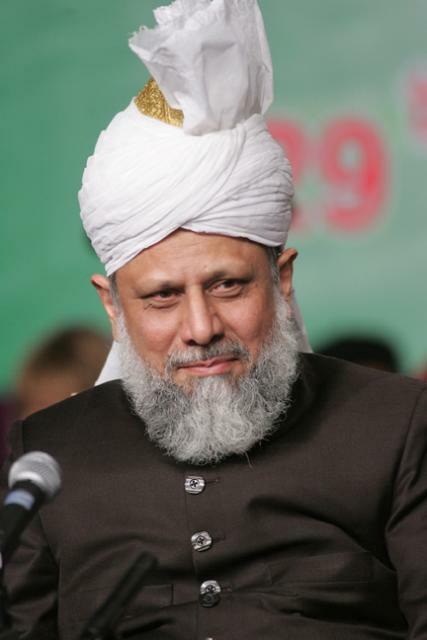 This week, Masroor Ahmad brought up the Third World War in an address to adherents in India, of all places. Enough said. Again, it would be hilarious were it not so dangerous. And very dangerous: on that evening, I received an email from concerned Ahmadis in United Kingdom that local Qadiani Ahmadiyya organisers were urging people to stock up on food, as Britain was about to be engulfed in a war. Maybe it is advance warning of another Gulf War received via Lord Ahmad of Wimbledon (an Ahmadi peer). Most likely, it is the Qadiani Ahmadiyya taking on another dangerous cult-like turn — a turn it never fails to take at least once every ten to twelve years, counting upon the short memory of their detractors. The last two such belligerent phases were in 1988-1992 and then in 1999 to 2001. We strongly urge Mirza Masroor Ahmad and the Qadiani Ahmadiyya leadership to back away from these belligerent tactics as they are causing a gulf between communities in the West and Muslims. His little group will light a match and run away — and other Islamophobes cannot distinguish between these pseudo-Muslims and real Muslims. Dear Mirza Masroor Ahmad, this postponed exhibition in Dewsbury may or may not go ahead — but one thing is sure — it is not going to work out as you expected. It will definitely backfire in due course.